The little lady pictured right began my quest for the perfect baby gift. Her Grammie fondly remembered dressing her own daughter in delicate little embroidered diaper shirts, no longer available in retail stores. I finally tracked down a dozen of them, along with some sweet little dresses, from an estate sale. Worn in the 1930s, they had been carefully laid away in a grammie's attic to await future generations. I've always loved fine linens and was thoroughly smitten by these handmade garments and their lovely fabrics, exquisite embroidery, and careful craftmanship. I continued to collect and restore these little treasures, adding bibs, bonnets, and baby linens, until my new hobby evolved into this web store. I was so excited to see a whole new generation of babies wearing these special things! I love to see babies dressed like babies instead of mini-adults. But you know, the old saying is so true -- when a child is born, so is a Grammie! 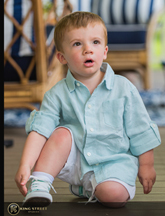 With the birth of my beloved first grandson pictured above, Grammie's Attic really took off! I realized that busy moms need no-fuss wardrobe staples as much as they need beautiful special occasion garments like christening apparel. I scouted out the select companies that offer beautifully styled and detailed baby clothing in easy-care fabric blends as well as lovely cottons and linens. I enjoy finding the best of timeless, classic styles from the leading designers including Feltman Brothers, Will'Beth, Sarah Louise, Gordon & Company, Katie & Company, Bailey Boys/Chabre, Petit Ami, and newcomers Marco and Lizzie and Le Za Me. Trips to England seeking even more classic designers led me to some fabulous heirloom christening apparel. Who can resist these darling little outfits to make baby's special occasions -- coming home from the hospital, christenings, holidays, birthdays, and portraits -- even more special? They are certain to become treasured heirlooms for the next generations, too. So Grammie's Attic -- your source for heirloom and classic baby clothing -- has grown through the years, adding dozens more classic vendors, hundreds more styles, thousands more items, and best of all the most wonderful group of dedicated customers. It hardly seems possible that it has been more than fifteen years since it all started. Can those precious baby twins who just bought their christening gowns really be shopping for their First Holy Communion dresses? And ... best of all ... "I" has become "we". In 2012, we moved Grammie's Attic from Maryland to South Carolina and closed our retail store. Now we offer our customers our entire inventory through our webstore alone. 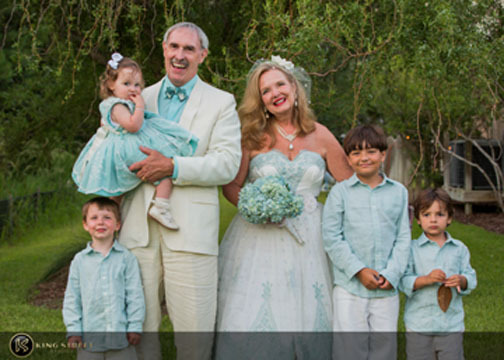 A year later, Grammie and Dave married in a lovely vintage 1950s style wedding at our home with our beautiful grandchildren as attendants. Our littlest guy was living in England at the time and couldn't be with us at the wedding, but he paid us a visit soon after moving back to the States!